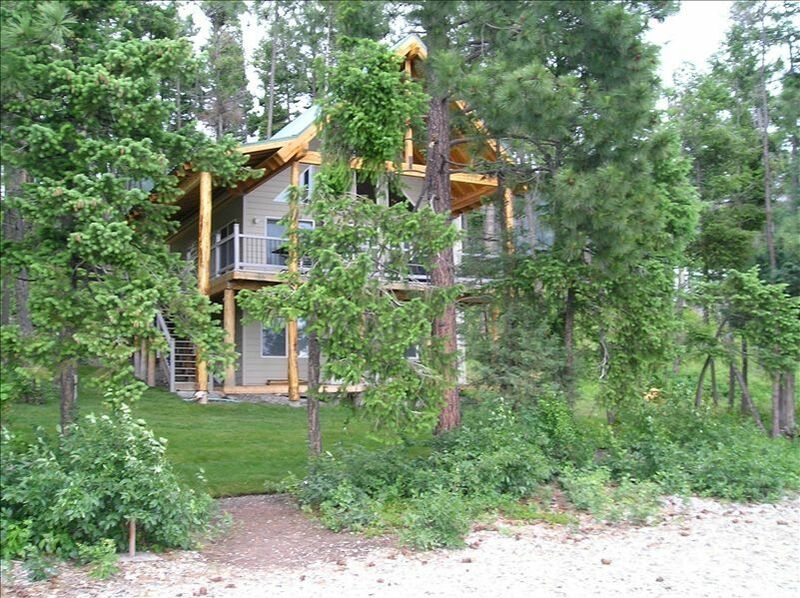 Located on beautiful Flathead lake between Yellow Bay and Blue Bay on Sunset Bay (East Shore). Only 15 miles from Big Fork and Polson where you can enjoy dinner, shopping, theater and all sorts of fun activities. 1 acre property with cherry orchard and beautiful lake views with over 109 ft. of lake front/level pebble beach to play on or enjoy a campfire. 2 bedroom, 2 bath and sleeping loft. Full kitchen and two living rooms. Large covered deck to watch the amazing summer sunsets from while enjoying a nice BBQ. Private dock with shore station to park your boat, fish from or just sit and enjoy the day. NO PETS/ Non Smoking facility. For the golfer, 15 miles to the South Polson Country Club offers 27 beautifully maintained holes. 15 Miles to the North enjoy Eagle Bend in Big Fork. For the hiker, and biker, enjoy many trails close to the cabin or make your way North and explore Glacier National Park which is only an hour away. For the skiers: Whitefish Mountain in Whitefish, MT or Snow Bowl in Missoula, MT are each about an hour and a half from Polson. Blacktail Ski Resort in Lakeside, MT is about ¾ of an hour away. Hurry before availability slips away. Dock with Boat Mooring to pull your boat out of the water. Had an amazing time on one of the most beautiful spots on the lake. House slept four adults and two children very comfortably and could easily have slept more. Would love to come back again next year. It was a perfect cabin for our family! We had the best time and look forward to more!! My husband, three kids, and I thoroughly enjoyed staying here. We had previously rented another cabin, but as our family grew, we needed more room. This suited us perfectly--plenty of room when we had grandma, grandpa, uncle, aunt and cousins. The loft was fun for the kids, and we enjoyed the privancy and coolness of the basement bedroom. The cabin was well-stocked, very clean and well-maintained. Loved that the water was practically in the backyard. One of our favorite things was having a campfire, roasting marshmallows, and watching the beautiful sunsets in the evening. The owners were very accommodating and helpful. An incredibly relaxing and wonderful week!